Should You Cosign for a Family Member? Back in 2010, I worked as a debt collector. They eventually fired me for being too nice (and, I speculate, too ethical). The pay was peanuts, my coworkers were awful people, and it was the worst job I ever had. But I learned so much about debt by talking directly with debtors. One of the most common things I heard when calling up a debtor was the excuse, "I don't owe that debt. I just cosigned with my mom on the car. She stopped paying, and you guys started calling me. I don't know why. I never used the car a day in my life." Then, if they didn't hang up on me first, I would try to explain to them that this is exactly what cosigning means. Cosigning isn't just giving a good reference. It's signing up to be responsible for the whole debt. I see the question on internet forums all the time: "My parents want me to cosign on a loan for them. It's just my signature, and I'm not really sure what it means, but if it helps my family member I should do it, right?" Wait. Hold up. There's a lot more to cosigning than putting your signature on a page. When you cosign, you become Jointly and Severably liable for the debt. Jointly and Severably Liable is just a fancy way of saying, "Both of you are responsible for this debt. If one of you stops paying, the other one has to pay the whole thing. No halvsies, no excuses, doesn't matter who used the loan. We can come after you both for the amount in full until the whole thing is paid off by somebody." Cosigning is basically a way for the lender to ensure there's a back-up person on the hook for the debt in case the borrower flakes out. If you cosign with your sister on an apartment, and your sister stops paying, they will come after you for payment in full. It does not matter if you never used the apartment. When you cosigned, you took on this responsibility. Cosigning is a way to owe a debt without benefitting from it. Your friend benefits by getting a better rate or qualifying for a loan they otherwise wouldn't be able to take out. The bank benefits by securing a back-up payer, increasing their chances that they'll get their money back. You benefit by..... well, how do you benefit by cosigning exactly? Perhaps you earn some social brownie points with your friend. Is that worth being liable for hundreds of dollars in debt? 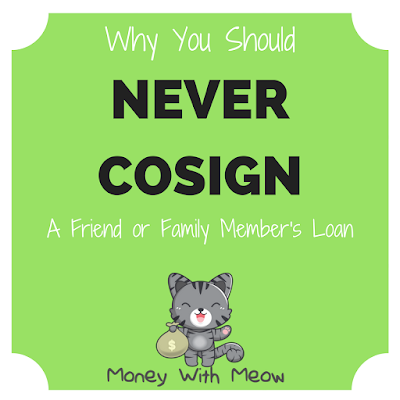 If the bank wouldn't give them the loan without a cosigner, it means the bank thinks they're too risky to lend to without a backup. It's all over the news: banks tend to get in a lot of trouble for taking on too much risk. And if the bank wouldn't bet on your sister, why should you? It has nothing to do with whether you love her as a person. If you wouldn't give her the amount of the loan as a gift, with zero expectation of repayment, then DO NOT COSIGN. When you cosign on a loan, it shows up on your credit report just the same as if it was you borrowing the money. If the original borrower is late on a payment, it shows up on you credit report just the same as if you were late on a payment. You might not even know the account is overdue until months later- when it is too late to save your credit score. Even if the original borrower makes all their payments, having the debt on your credit report can still affect your ability to get a loan for yourself. Lenders judge you on your debt to income ratio when considering whether to give you a loan. If you have someone else's loan on your credit report, it could bring up your debt to income ratio and prevent you from getting a loan. If you realize later on that cosigning was a bad decision, it's almost impossible to take your name off the loan. The original borrower will have to qualify for the loan all by themselves, or find a different sucker - I mean cosigner - to take on the responsibility. If they slip up and miss a payment, or if they stop paying entirely, do you think it will be easy for the relationship to recover? I don't think people generally intend to screw over their cosigners. Sometimes, it's not even their fault. The bank may process a payment late or incorrectly, that error will affect your credit score for years to come, and you'll be screwed over. And when cosigners get screwed over, the friendship gets seriously damaged. "I can't have any more debts on my credit report right now." You can tell them that you're trying to purchase a (home/car/underwater basketweaving apparatus) in the near future and you need your credit spotless for that. Then again, you don't even need to give them that information. You may have zero debts on your credit report and not plan on having any in the future... but in that case, isn't one debt too many? "I'm not comfortable taking on that kind of responsibility." If they tell you that it's "just a signature", they might not even realize all that cosigning means. In that case, I hope you direct them to this post. I don't think they can stay mad at you if they realize the full burden that cosigning would put on you. "I never cosign for anyone." Saying this makes it clear to your friend that it's not their fault, and helps avoid bad feelings. 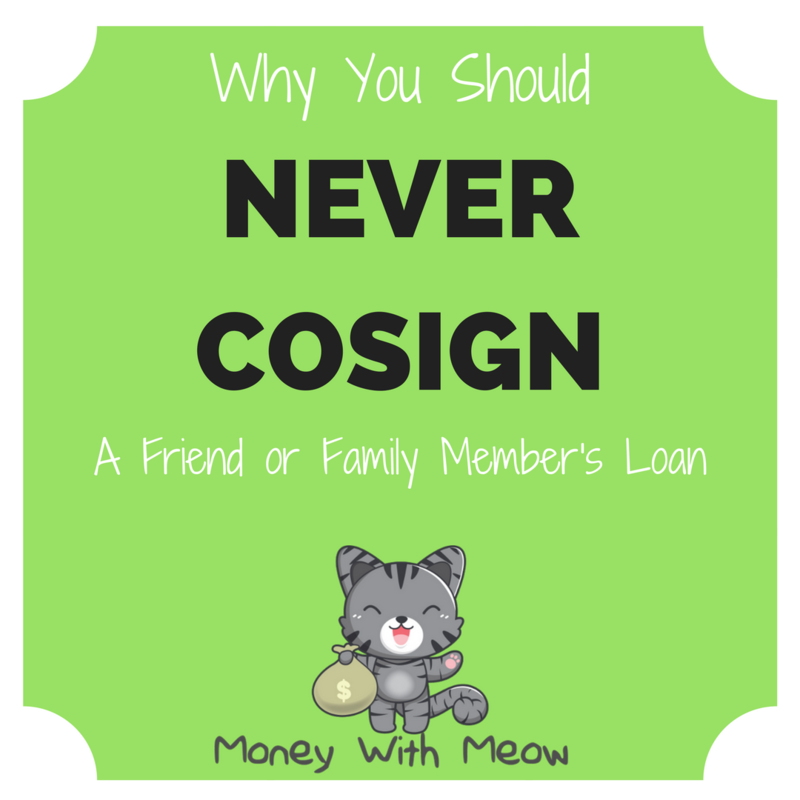 Choosing to never cosign anyone's loans is just good personal finance smarts- can they really fault you for that? If you really want to help them, offer a gift instead of cosigning on a loan. You should never lend someone more money than you can afford to lose completely without affecting the friendship. If your friend is in serious trouble and you can afford to help, send them a check. Don't be guilted into it, though: your money is yours to spend how you think is best. Do you have any tips for telling someone you won't cosign? Got any cosigning horror stories? Tell me in the comments! Oh, there's definitely such a thing as collectors anymore. It's easy to forget they exist when they're not calling you. :) Unfortunately, the job wasn't telecommuting: it was a "boiler room" call center in a grey concrete box. I made $10/hr with 50hr weeks. Still, I felt lucky to have any job at all in the Cleveland area in 2008. Lots of my coworkers had been recently laid off from dignified banking positions, and taken a 50%+ pay cut to stay employed at all. Someday I will write a tell-all about my time in that job. Agreed! I just don't get why people commit to stuff like this so easily. I get that it's family. And I get that they're friends. But it just makes no sense, no matter how you look at it. I agree that helping them with cash is far better than co-signing on the loan. And if you're helping with cash, then mentally log it as a gift rather than a loan because chances are they won't pay back. JMA credit control, reputed debt collector agency offer commercial debt collection, recovery and other financial services.